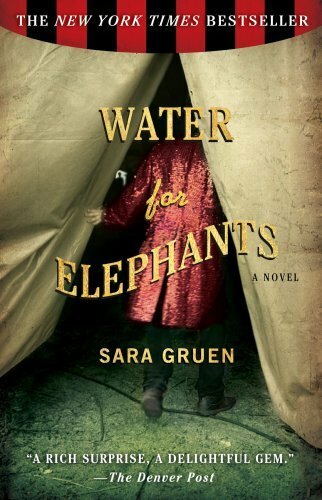 I still haven't read Water for Elephants by Sara Gruen, but it's definitely in my To Be Read Pile. The trailer was recently released and I must say I'm really loving it. Okay, okay maybe it has a little to do with the fact I think Rob Pattinson and elephants are flipping adorable, but still it looks interesting. Is anyone else planning on seeing this film? I'm really big on movies having the same vibes as their books, but since I still need to read this one I don't know if they're similar. Anyone who has read the book looking forward to the movie? I'm definitely going to be reading the book before I see the movie so I'll have a post about that after Water for Elephants is released. I enjoyed the book. It's not the most amazing book of all time, but it's a fast read and I couldn't put it down once I started. I am looking forward to the movie, but I'm definitely expecting it to be different. The book showed the darker aspects of circus life and I wonder if the movie will go into that at all (I'm not expecting it to). I started it and it moved me so much that I had to stop. It was beautiful and couldn't stop crying. I can't wait to watch this film. "Rob Pattinson and elephants are flipping adorable" LOL> I KNOW!!! also, i am SO out of the loop - never even heard of it - but i watched the trailer and it looks particularly AWESOME.